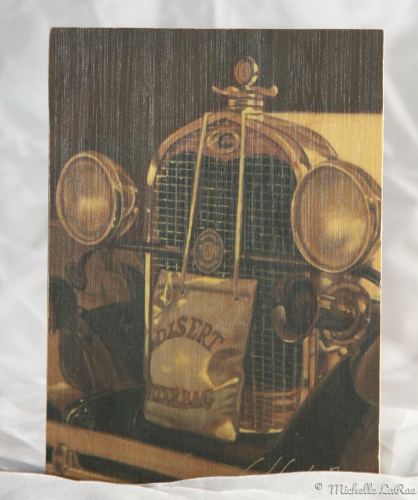 This is a professional quality print on bamboo of the original painting, "Bentley Flyer". It is mounted on a box frame. This painting was inspired from a 1926 Bentley Speed Six that I saw parked in a prestigious car show. The car had been previously owned by Nicolas Cage, as I was told. The car was a beautiful green, with an aggressive racing stance. I instantly fell in love with it. I wanted to capture it on canvas in vintage, sepia tones, as if I was working from an old photograph. The 6 1/2 litre "sport model" Bentley was co-founder W.O. Bentley's choice for their Racing efforts. The Bentley Motors' 6 1/2 litre Racing cars were unveiled in 1926, and would continue through 1930. Bentley's straight-6 engine included an overhead camshaft, 4 valves per cylinder, and two spark plugs per cylinder; all exotic technologies at the time. The Bentley 6 1/2 litre cars (called the Bentley Speed Six starting in 1928) would become the most successful racing Bentley, winning the Le Mans every year from 1927 through 1930. This is a professional quality print on bamboo of the original painting, "Auburn Arrival". It is mounted on a box frame. This painting was inspired from a 1936 Auburn Boattailed Speedster that I saw parked in a prestigious car show. I wanted to capture it on canvas in vintage, sepia tones, as if I was working from an old photograph. The elegant Auburn Boattail Speedster 852SC was a supercharged elegant dream to view. Designer Gordon Buehrig and engine designer Augie Duesenberg were tasked with creating a new design. The Art Deco inspired 852 featured pontoon fenders, split raked windshield, accented with chrome trim throughout, and a famous tapered "boat tail". Powerful! The supercharged straight 8 engine in the Auburn Speedsters allowed racer Ab Jenkins to take an Auburn to the Bonneville salt flats, where he set 70 records including averaging 102.9 mph for 12 hours. 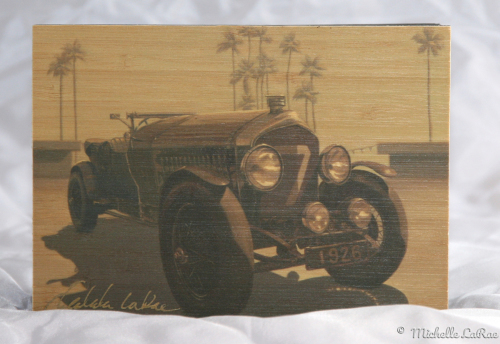 A dashboard plaque on each car contained a signed guarantee by Ab Jenkins that it had been driven to more than 100 mph before shipment. 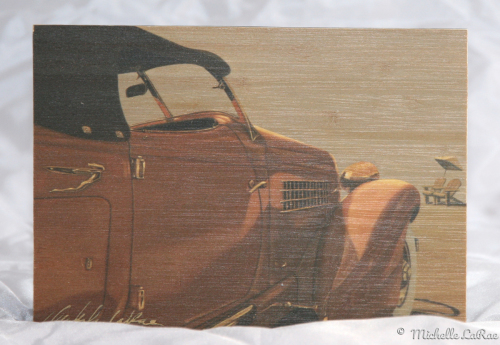 This is a professional quality print on bamboo of the original painting, "Thirsty for the Road". It is mounted on a box frame. The Water Cooler Bag pictured on this 1928 Model A Ford was used for several purposes. Because the bag is porous, the wind kept the water in the bag cool (unlike a canteen). When the bag was placed in front of a radiator it kept the Ford running cool on trips through the desert. 1928 was the first year for the Ford Model A, replacing the Model T. In 1928, $385.00 could get a Roadster and $395.00 would get you a beautiful Phaeton. At $495.00, the new Ford Coupe was nice but for $550.00 the Sport Coupe with a standard Rumble Seat was a hot seller. The Engine was a flathead 4-cylinder; with 40 horsepower at 2200 rpm. Typical gas mileage was between 20 and 30 mpg using a Zenith one barrel carburetor.